Marriage! Marriage? How had she come to this? Marrying a man she did not know. She hadn’t even met! Why had the Fates chosen her for such troubles at the mere age of one-and-twenty? What was her father thinking? Had there been no other option, after all that had befallen her, than to whisk her from London and palm her off on a complete stranger? Elizabeth, elder daughter of Doctor Richard Mannings, Homeopathic Practitioner, stood at the door of the large, elegantly furnished drawing room wringing her handkerchief in damp hands. Searching for composure, she took a moment to survey the room. Two magnificent crystal chandeliers sparkled in the late afternoon sunlight that streamed through large french doors. The numerous doors flanked fireplaces at each end of the room and marched down the long wall between them. The room was opulent, lush enough to compare with many she had danced in during the Season currently winding down in London. The draperies were made of a rich, multihued tapestry which included burgundy, hunter green, and a dark blue. They hung dramatically at the windows enhanced by formal, bullion-fringed valances of burgundy that cascaded down each side. Many of the young ladies of the ton would surely give up their town habits to be mistress of such grandeur. Could she? She wrung her handkerchief tighter. The chairs and divans were beautifully upholstered with luxurious damask in what seemed to be the signature color of burgundy. The walls overflowed with pictures that included landscapes and portraits, most of which were mounted in ornate gilt frames. She sighed deeply. 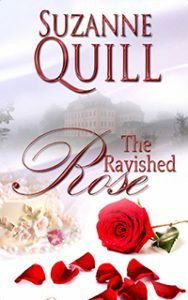 Regardless of the richness this marriage seemed it would provide her, Elizabeth felt hollow inside. What was wealth without affection, companionship, love? Her gaze stopped at the far end of the room. The fireplace at that end held a small blaze that seemed to discomfit the reverend standing before it. His right hand held a worn black book that could only be his Bible; his left hand fiddled with his collar, which he circumnavigated with a finger as if too tight or too hot. She could only sympathize with his discomfiture. She, too, would fidget if years of formal upbringing had not trained it out of her. She sighed again as she worried the hanky further. Movement to the right of the reverend caught her gaze as a man of large stature stepped forward, as if some surreptitious signal had been given. She knew instantly this was to be her husband, Allan Ridgefield. Her heart skipped a beat, then took on an erratic pattern as she noted his lowered head and resigned attitude. Joy and enthusiasm did not emanate from his person either. Knowing he did not watch her, she took the liberty of perusing her soon-to-be husband. After all, she would be in his charge for the rest of her life. He was younger than she had ever hoped for and feared when the entire matter had been discussed, then foisted upon her. He was likely no more than one score and ten. Despite his bowed stance, he had to be more than six feet tall, but his height was balanced by a physical strength she had never thought to expect, much less hope for. His shoulders were broad, his waist and hips narrow and attractively outfitted in a rich brocade of blue and buff. His legs, covered in skin-tight buff breeches, must be all muscle because the taut fabric lacked the telltale puckering of discreetly placed padding. As her eyes came back up his body and her heart continued a fluttering tattoo, she took in his face, which was still cast down, as if in deep thought. His jaw was strong and firmly set. His lips, bowed slightly, were drawn together. Golden hair was drawn back and held by a black ribbon but a number of loose, wavy strands surrounded his face, softening the chiseled lines. The nearby window let early afternoon sunshine fall upon his head, giving it the glow of a halo, as if he might be her savior rather than yet another tormentor. If only that could be true. She had never dreamt that her lot in life would be so out of her control and fractured. Coming out of her reverie, her gaze returned to his face. His eyes now fully focused on hers. A small gasp escaped her lips as her heartbeat thundered in her ears. What was so wrong with him that he, too, entered an arranged marriage with no love or profit involved? It was not as if he married her for her dowry or title, as she had neither. Her mind reeled at her desperate circumstance and the pull of the physical presence of her intended. She was startled by the housekeeper’s subdued voice. “Here, my dear,” Mrs. Peters, the woman she had met fewer than two hours prior, said kindly. “Every bride must have a bouquet. I hope this one will do. It’s from our garden, you see.” She handed Elizabeth a large collection of roses. The scent that emanated from them filled her head and brought pleasant thoughts of her friend Amanda and the Jenners’ beautiful rose garden. But then her memories darkened as she remembered crushed roses, humiliation, and intense pain. She felt hot tears sting her eyes. She would remain strong, regardless of her life spinning out of her control. Her questions remained unanswered, her misery unchecked. She had no choice and, evidently, she had no other options. The recent past had destroyed what she had hoped, planned, for her future. Gone was the promise her parents had made that she could marry for love, that she could choose the man with whom she would spend her life. Gone were all her hopes and dreams. She took a deep breath and, in the calmest voice she could command, said softly, “Thank you, Mrs. Peters, how very kind of you to think of them,” and watched the woman step back. She turned to her mother, Eleanor, who stood stoically beside her. Elizabeth could see pain as well as tears brimming in her mother’s eyes, eyes the same shade of green and shape as her own. She, too, was unhappy with the circumstance, but had no way to change it. Elizabeth’s parents had spent hours in discussions. Though behind closed doors, Elizabeth and her younger sister, Jane, had listened, ears pressed against the mahogany, as Eleanor pleaded for another option to offer their elder child. None was presented, none available. Eleanor had resigned herself to the actions now taking place and offered the most supportive demeanor she could. Elizabeth watched as her mother walked slowly toward the fireplace, curtsied slightly at the two men before it, and sat to the left in a chair provided. She looked up into his face. He looked older than she had ever seen him before, his face lined, his brown eyes worried, and there seemed to be even more silver in his black hair than only five days before. “I know, Father. It’s what we must do. We’ll just have to hope it works out for the best.” Elizabeth took her father’s right hand with her left and squeezed gently. “At least I should be safe here. And he doesn’t look too bad. At least he’s not old enough to be my grandfather.” She smiled as best she could. “I had him thoroughly vetted, Elizabeth. He has a good reputation. He’s a decent man. He will provide for you and keep you safe. For now that’s all we can ask. Perhaps, over time, my dear, you can grow to love him.” The look in his eyes was sincere and even a little hopeful. Gently, he turned her toward the door to advance upon her future husband. In moments, she stood next to her betrothed as she stared down at the flowers, not daring to meet his gaze again. She listened to the words the reverend spoke, trying to keep her tears from flowing. She could not. The reverend came to the part where he asked them to join hands. Her mother came forward to take the flowers, but not the rumpled hanky that was damp in her hand. Still looking down, Elizabeth turned to see the Earl of Ridgecrest’s large, strong, left hand rise to take hers. She realized then his hands would touch her, and touch her intimately. She would be his possession in every sense of the word. How could she bear to be handled by yet another stranger? His hand was steady in her fragile, shaking grasp. The palm she touched with her fingertips was callused. This man was no fop. Would he be rough with her? Would he beat her? Would he hurt her? The reverend handed her a ring, which she took with trembling fingers. Following after the reverend, her eyes still staring at his hand in hers, she repeated, “With this ring, I thee wed . . .” She watched as the earl extended his fingers, splaying them slightly. She took a deep breath as she concentrated on steadying her right hand, then placed the wide gold band upon the third finger of his left hand. It was the earl’s turn; he took a second band from the reverend’s grasp. He gently lifted Elizabeth’s left hand in his. She fought the shaking that seemed to be out of her control, then gasped as a single tear dropped from her downcast eyes onto the back of the earl’s hand. The reverend repeated the words once again as the earl placed a ring studded with rubies upon her finger. “With this ring, I thee wed . . .” his voice strong and rich; its resonance moved her somewhere deep inside. She could no longer help herself; she raised her face to meet his eyes. The blue she saw there was cold, hard and shuttered, as if he had much pain hidden in his past. She looked deeply, searching for something that she could touch, some place to tender hope. The earl looked down at her tearstained face. Could he not comprehend the fear, pain, and doubt that filled his reluctant bride? Her hands trembled in his. Her eyes surely showed the many questions that flew through her mind at this most important moment. Then something shifted between them. His blue eyes softened as he gently squeezed her hand, as if to tell her that it would be all right. Had he been touched by her anxiety? Did he recognize her fear and apprehension? Elizabeth hadn’t expected the change in his attitude, which startled her at first. Then she was reassured by his gentleness as she let out the breath she had been holding. Elizabeth steeled herself to receive his kiss. She knew it would happen but when she felt his lips upon hers, she was stunned by the energy that passed between them. She had been kissed before, though not often, and yet never had a kiss affected her so. Her heart fluttered again. Her blood thundered in her veins and, deep down in the pit of her stomach, she felt a gripping, almost a need, spread through her. Though the kiss was brief, she was weak in the knees when he released her, nearly swooning. Her mother quickly stepped forward, as did her father. But the earl caught her by the elbow to strengthen her step. She looked up at him in a questioning manner. He nodded almost imperceptibly as if to tell her once again, everything would be well. The reverend spoke again. “A feast has been laid out in the dining room. Lord and Lady Ridgecrest would be most happy if you would take this time to break bread with them.” He waved his hand in the direction of the door. Her parents and the household staff followed her and her new husband to share the repast and celebrate their union. This is the fourth book in the The Order of The Crimson Lotus Series.